Modern factories demand the highest standards of hygiene. 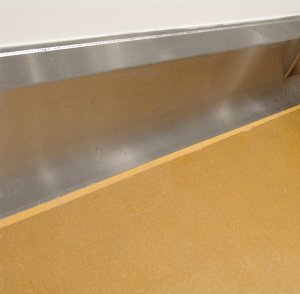 Traditional tiled and resin floors are weakest at the point at which they meet the wall. A stainless steel kerbing system offers impact resistance together with meeting the hygiene standards required in these demanding environments. 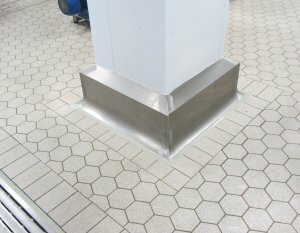 Kemtile supplies and installs high quality stainless steel kerbs which are designed and produced specifically for the food and drink industry. They are available up to 20 metres in length and have a standard cross section. Corners to walls and pillars are pre-formed in the factory. A unique manufacturing process offers longer lengths and straighter sections. This means unsightly welds can be avoided in straight and accurate runs. Kerbs can be fixed against existing walls. Or, where the facility is a large open space which is divided into manufacturing areas, the kerbs act as demarcation. The kerbs are fixed to the existing floor or prepared substrate with steel bolts and dowel pins and are then filled with concrete. They can also be used to form bounds within which the flooring is laid. Different flooring systems and thicknesses can be laid either side of the kerb. All systems are based on one proven profile.